I thought about saving this one for the NFL playoffs or the Superbowl, but then I realized you all are probably doing a lot of partying these days. What with all the holiday family gatherings, work parties, Christmas and New Year's Eve. 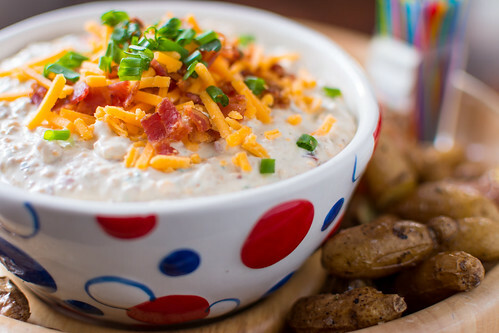 Maybe a super easy, crowd pleasing dip would come in handy right about now? 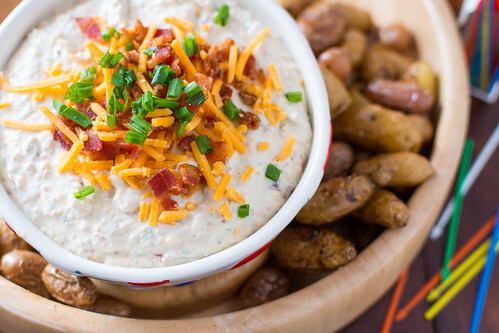 This dip has all the toppings you love on a baked potato - sour cream, cheese, bacon, some chives. Only this way you get a higher toppings to potato ratio which is all anyone really wants, right? If you're traveling with this then just serve it with some thick-cut potato chips, but if you're home and have the oven space, it totally deserves to be kicked up a notch with creamy, crispy-skinned fingerling potatoes. Little mini baked potato dippers! Just make sure to have some pronged toothpicks or forks so you can get a good grip on the little buggers! 2. While your dip is chilling, roast the potatoes. Preheat oven to 425F. Clean up the potatoes and dry well. If the potatoes are on the larger side, cut in half, or otherwise bite sized pieces. In a bowl, toss the potatoes with 1-2 Tbsp olive oil until well coated. Spread evenly on a greased baking sheet, or 2 baking sheets if needed, and sprinkle with salt. Bake for 20-25 minutes, or until potatoes are soft on the inside and the skin is slightly crispy. Serve warm with dip.